We originally ran this blog post last May 1st on the Mind Body Spirit Marketplace Blog on 1000 Markets. Everyone loved it so much I decided to post it again this year. Thank you so much Nellie and Emily for such a beautiful piece! It seems that everyone I talk to is impatient for warm and sunny days, tired of the cloud cover and chill air of the darker half of the year. I'm certainly ready to celebrate the green growth of spring! This desire to feel sun on our skin and soil beneath our fingernails makes Beltane - or May Day as it is generally practiced today - such a comfortable, accessible holiday. May Day is widely and openly celebrated through the British Isles, as well as in many places in the US. People dance around the May Pole, sit by bonfires, and gladly toss their winter worries away as they look ahead to brighter days. Dreams come back to life, as we draw upon the fertile energy of the day. Traditionally, Beltane was celebrated by the Celts with much dancing, drinking, music, merriment, and romance. It was one of the two most important of their celebrations - celebrating the light half of the year. The name Beltane is believed to mean "fires of Bel" and honors the ancient sun god Beli, or Belanus. 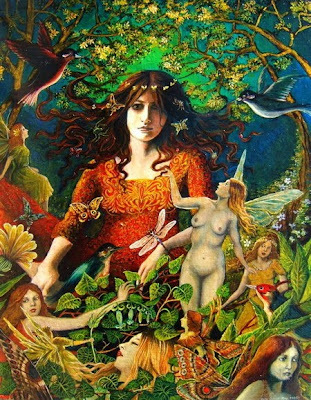 Druids looked after the Beltane fires, by which people and their livestock would pass, with the belief that they would be cleansing themselves of the illness or misfortunes they may have experienced through winter, and perhaps blessing them with good fortune for the months to come. We can light our own bonfires, and we can honor any deity we like... We can make a May Pole or just make some music... what I think is important if we are to celebrate Beltane today is that essential message of taking a deep breath of fresh spring air, embracing the renewed life of warmer seasons, purifying ourselves of our past troubles, and looking with openness to the growth ahead. About the artwork... This is the beautiful May Queen by Emily Balivet. Please take a look at her shop, for exquisite mythological goddess art.